Want to get outside and snap some amazing photographs of the night sky, of some stunning moonlit landscapes and time-lapse starlight trails? Here are six key tips you need to know. 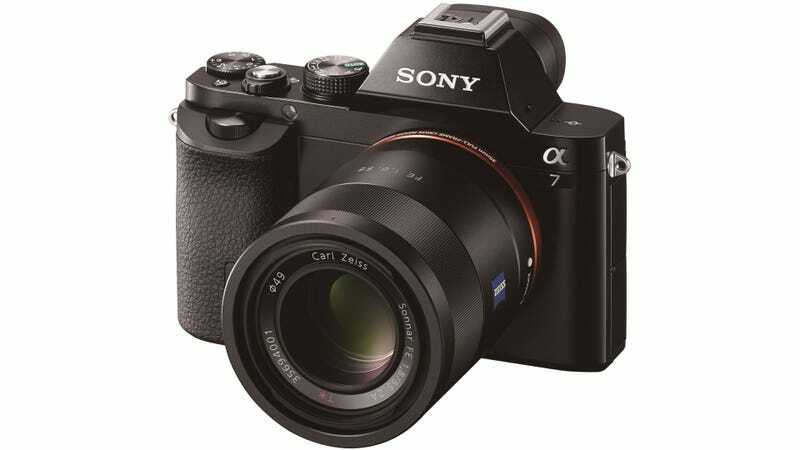 Gizmodo’s Guide to Better Photography is brought to you by the Sony Mirrorless Alpha Range. Photography has evolved, and Sony mirrorless cameras have made the DSLR obsolete. Find out which Mirrorless camera is right for you. This is the big one. At night, there’s less light for your camera to pick up and funnel down the lens and turn into little digital ones and zeros. And that means your camera has to boost the digital gain of its image sensor — creating unwanted noise — or slow down its shutter speed, potentially causing unwanted image blur, or open up its aperture — meaning less of the image is in sharp focus. The easy solution to that is to use a sturdy tripod for your camera, to hold it steady to capture light no matter how slow its shutter speed is and how long it has to take to capture any given photograph. You can buy a huge variety of tripods — tall, short, heavy, light, carbon fibre, aluminium, plastic — but what’s most important is that it holds your camera well and won’t shake or topple at an inopportune moment. A heavy tripod can be an inconvenience if you’re planning to take it travelling or if you like moving around a lot while taking your night-time photographs, but at the same time it’s an easy solution to eliminate photo blur from shaking. Usually, the more expensive a tripod is, the better a job it will do — this is why exotic materials like carbon fibre are pricier, because they combine that prized duo of portable/light and stable enough to make your photos clean and clear of unwanted blur. Setting your camera’s shutter speed is just about the most important thing you can do for capturing a night-time photograph. The reason for this is that your camera — whether it’s a compact or whether it’s a more powerful mirrorless camera or digital SLR — will only go so far in its automatic settings, especially since those are optimised for handheld shooting. Whenever you’re on a tripod, it’s a great idea to switch to entirely manual camera settings, but at the very least a customised shutter speed will give you majority control over the images that your digital camera produces. A manual shutter speed gives you control over a huge number of variables just by switching one knob or twiddling one dial. A slow shutter speed lets you blur motion — like the walking of pedestrians, the motion of cars or the waves in an ocean landscape at the beach — while a fast shutter speed will freeze things in place. Obviously the faster your camera’s shutter is set, the less light it will let in, so you’ll either need to be snapping a photo of a relatively bright scene or need to be carrying around a powerful flash to give your camera a bit of a leg up. Camera image sensors have one big caveat — the less light they have available to them, the more they struggle with picking up colour and brightness information from the outside world and converting it into a digital signal. You might have heard of a camera’s ISO rating — think of it as the volume control but for an image sensor, with the caveat that the higher the volume goes, the more background noise and interference starts to appear. This appears as grain and purple-green dots on your image. For that reason, you want to keep your camera’s ISO setting as low as possible to make images as clean and free of digital interference and noise as they can be. If you switch your camera’s ISO to a relatively low setting — that is, an ISO of around 400 or lower for most cameras, and generally as low as possible is advisable — then your night-time images will look clean of any digital noise and won’t look like they were captured with a $10 smartphone camera. Of course, your camera’s ISO directly affects the shutter speed and aperture of your camera, meaning the shutter will have to stay open longer to let in the same amount of light — and that’s why if you’re shooting at night, you really should invest in a high quality tripod and use it whenever you want to capture beautiful images of the night sky. Cameras generally aren’t the best at picking the correct white balance from a night-time scene, unfortunately, and especially if you’re not already shooting in RAW mode then an incorrect white balance can ruin what would be an otherwise good night sky photograph, usually making it look far too blue or far too yellow. Setting a custom white balance in your camera’s photography settings menu, or even pre-selecting one of the more moderate presets like a cloudy or a daylight mode, will make a huge — and easily noticeable — difference to the colours within your photos, and will also prevent differences between individual images in a series. If you’re shooting a scene that has artificial lighting. As our cities move towards LED lighting in public spaces this is becoming less of a problem, but if your images are coming out with an especially orange or yellow hue for artificial lights then setting your camera’s white balance to an incandescent or tungsten white balance can be an instant solution to the problem. Try your camera’s auto white balance setting first, of course, to see the results that it produces, but then don’t be afraid to jump to a custom or forced preset white balance if you think that might solve the problems that your images are having. Shooting in RAW is the big one for shooting clear night-time photographs, since a RAW photo file contains a lot more behind-the-scenes camera and exposure and colour information than its ready-to-view JPEG equivalent. A RAW photo therefore has a lot more leeway for you to get a photo wrong and still produce a high quality image, or if you get the settings right a RAW photo can be adjusted to produce a more stunning photo than any in-camera JPEG can produce. If you plan to print your photos off and frame them or show them off for public viewing, the extra quality hidden away within a RAW is almost a mandatory prerequisite for night shooting. As skilled as you might be at capturing a night-time photograph, even if you think you set the exposure correctly and used a low ISO and long shutter speed setting, capturing in RAW is still a good idea Most good cameras can also capture in RAW+JPEG to allow you to share a file straight after capturing while still maintaining a much higher quality file to adjust on your PC later on and tweak to your heart’s content. This method does chew up storage space quickly though, so make sure you have an additional SD card handy or invest in a large capacity card early on. Picking up a wireless shutter release means you can set your camera to fire remotely without touching it, and that removes one of the most annoying — and easily avoidable — causes of blur in night-time photographs. Combine a wireless shutter release with a tripod and the right settings in-camera, and you’ll end up with photos that look just as good as pin-sharp day-time ones. A good wireless shutter release will also have a bulb setting, where you’ll be able to hold the shutter open as long as you want to capture extra-long exposures, and the best can be rigged to fire multiple shots that you’ll later be able to combine. If you don’t want to pick up a wireless shutter release or your camera isn’t compatible, you can fire your camera’s shutter remotely through another couple of methods. You might be able to hook your camera up to your smartphone over Wi-Fi, and use a companion app to change settings and start photographing without touching it or shaking the tripod around, for example. If nothing else, any half-decent camera should have a built-in timer that’ll let you fire the shutter and then wait a couple of seconds before capturing a photo to reduce any unwanted camera shake and lens blur. Republished from our cousins at Gizmodo Australia. Check it out for all of your other-side-of-the-equator tech news.